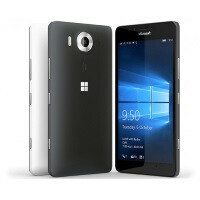 Microsoft has announced the February cumulative update for the Microsoft Lumia 950 and Microsoft Lumia 950 XL to Windows 10 Mobile 10.0.10586.107. After being sent out to those Windows Insiders in both the fast and slow rings, the update will start rolling out today to open market versions of the handsets. If Microsoft deems that there are no problems with the update, all other versions of the two phones will receive it over the next week. To check to see if the new build of Windows 10 Mobile is ready to be downloaded and installed on your device, go to Settings > Update & security > Phone update > Check for updates. If the update is there, make sure that you are connected to a Wi-Fi network. Also, you need to have your battery charged to at least 50%. Once those two conditions are met, you can go ahead with the update. Microsoft says that it wants to hear your feedback. If you have anything to say about this build of Windows 10 Mobile, click on the sourcelink and let the software giant know exactly what you think of it (the update that is, not the company). People still buy 'Lumia' phones? Just the name puts shivers down my spine! I still wonder why people buy Android and iPhones? BlackBerry 10 is still around, and will continue to be around, for quite some time: http://blogs.blackberry.com/2016/02/celebrating-priv-in-india-and-reiterating-our-commitment-to-the-blackberry-10-platform/ The new Lumia devices are just "place holders". Something to placate its users until Microsoft releases the Surface Phone, and I firmly believe they will be releasing the Surface Phone. Nadella wants to build a new legacy for Windows for Mobile users, and a new brand name with it (as far as handsets are concerned).